The MCASB internship program integrates work experience with academic and professional development that prepares interns for their future careers. Unique to the MCASB experience are the levels and diversity of responsibilities and the inherent range of topics presented to interns. The types of work assignments vary depending on the role, skill set, and level of experience of each intern. Interns will work together with their supervisors to create a mutually beneficial experience. MCASB interns acquire an interdisciplinary introduction to the Museum, how an institution of our size operates, and the specific skills essential to each department. Interns must maintain a working knowledge of the art and artists currently on view to successfully assist with tasks and big-picture projects in the office and facilitate engaging, memorable visitor experiences in the galleries while protecting the art. Mandatory training sessions are provided to each class of interns prior to the opening of each exhibition to familiarize interns with the history, programs, staff, and mission of MCASB. This educational internship is designed for students and entry-level professionals. 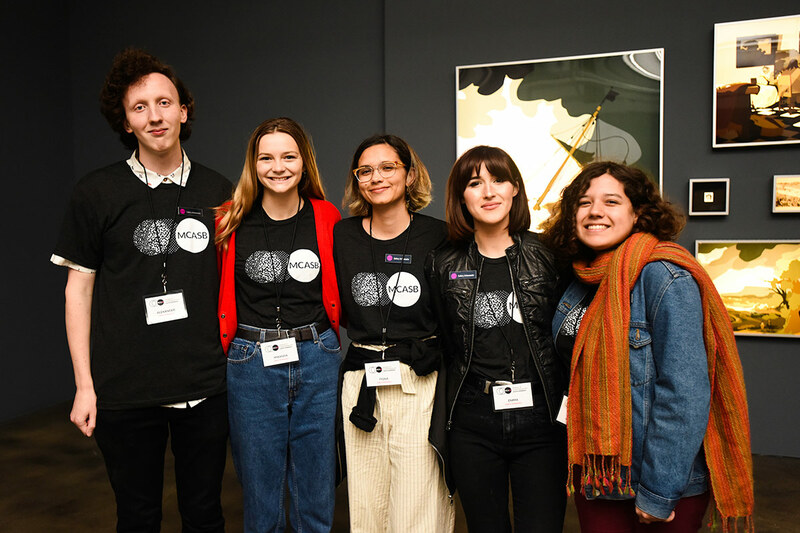 During their time at MCASB, interns have the opportunity to earn class credit, gain free entry into museums, meet with leading contemporary artists and art professionals, and begin building their creative network. Every participant has a chance to establish lasting relationships with MCASB staff, who are committed to supporting our interns both professionally and personally. It is highly recommended that applicants visit the Museum and review the MCASB website to learn more about our exhibitions, programs, and events before applying. Please click here to access the full position description and application. MCASB employees share a passion for the organization’s mission. The ambitious goals and many accomplishments of the museum are due to a large extent to the commitment, talent, devotion to high standards, and effective work of its staff. MCASB takes great pride in its cooperative culture and embraces it as one of our fundamental strengths. MCASB utilizes volunteers for a variety of projects, including but not limited to special events, educational programming, and museum administration. The work and contributions made by our volunteers provide invaluable support for the mission and daily activities of the museum. For more information about current volunteer opportunities please email hello@mcasantabarbara.org or call 805.966.5373 x106.